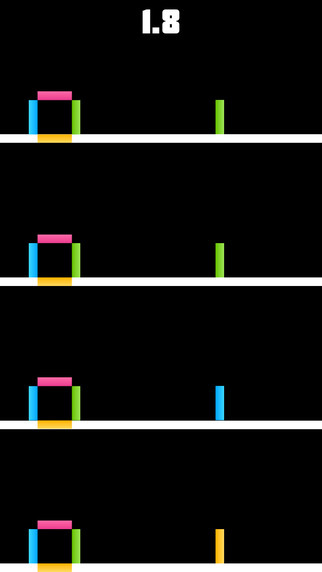 Amazing Dot - The Fun Game is a vertical jumping game that's very similar to Flappy Bird. I couldn't do that and I can't do this. I got through 3 levels and I'm giving up! Swipe Master - Swipe the Arrows like a Pro! 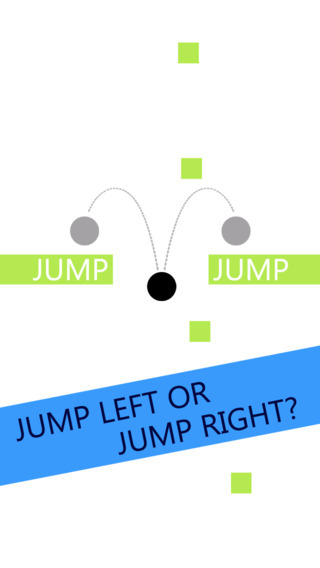 - is a point scoring puzzle app game. The arrows scroll down from the top and you must swipe in the correct direction. Zebra striped arrows must be swiped in the opposite direction. This game is not original. It's been done before. Nevertheless, we should all be playing these types of games to keep the brain synapses lightning fast. Cubecode comes from Montgomery Guilhaus. It's a point scoring game. You must swap pairs of cubes in order to get like cubes in a column. When that happens, you score points and gain time. I'm not really sure how the scoring system works. But my high score is 120 and that game lasted maybe 1 minute. Think fast and move your finger faster. Here's the deal: you are the mushroom and must draw 1 continuous path that will cover every square. The last square must land on a water drop. I downloaded the Lite version & solved all 10 levels. They're good! However, I'm in the middle of a similar game: Number Painting, which is more epic/insane with 500 levels. 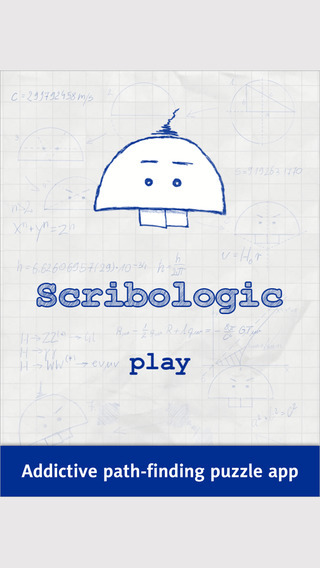 https://itunes.apple.com/us/app/scribologic-lite-logical-thinking/id929070462?mt=8 This is the Lite version. Cetin Caglar has created a point scoring game that's a combination of 2048 and Tripevo and Moskeez. The object is to combine pairs of numbers and upgrade them. Two 7's will combine to make a single 8. After each turn, a new number will randomly appear. Similar to a lot of other games, the numbers will combine if there's a clear path. If you cannot make a match, then 2 new numbers will randomly appear. This is bad. The game ends when you have no more room and cannot make a match. 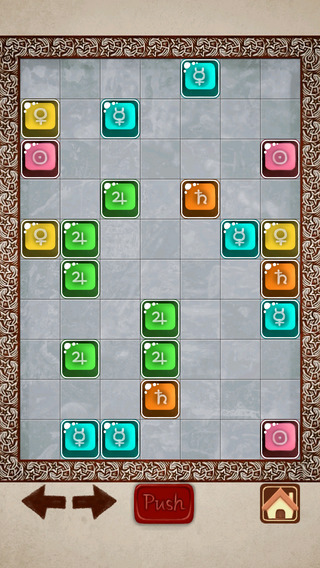 After every 24 moves, all of your tiles will be rearranged in a new location. Also when that happens, you don't get a new tile. This is critically important. 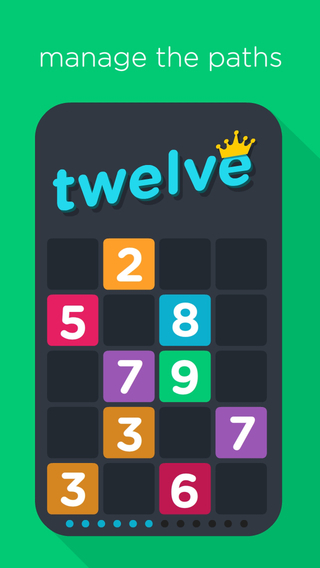 The highest tile that can be achieved is 12. 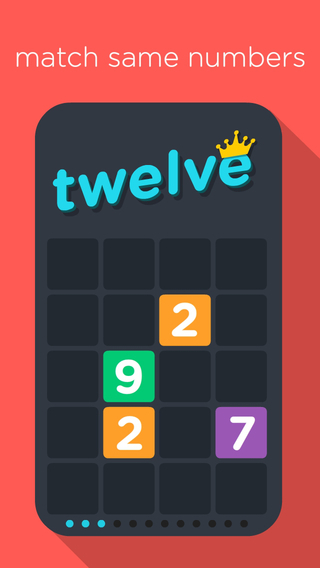 Twelve - Hardest Puzzle is a seriously good puzzle app. Quite possibly one of the best of 2014. My only criticism concerns the random tiles that pop up. They are only 1, 2 or 3. This makes the game go too slowly. At times it feels like solving a Chinese Rings or Tower of Hanoi puzzle. The game Threes! has a formula: whatever your current high tile is, divide that by 8, and that's the highest random tile that can pop up. My suggestion to Cetin: make the random tiles rise up to 3 less than the highest tile. My high score is 6539 which places me at #22 out of 29,000 players. That particular game took more than an hour. Not because I took my time. Getting the first 11 can take about 30 minutes. Addendum: I just found out that this game was updated. I've been playing the 'aggressive' version. There is now a 'normal' and 'hard' option. I'm not sure how they are different. Housecleaning: The List of Best Puzzle Apps of 2014 will be published on December 30 & 31. Get your party hats ready. Kevin Brain is the author of Slide It+. It's the traditional 15 puzzle, just presented differently. Nothing truly original. Good for young puzzlers. This video is only 5 minutes long. Matt Bahner is in HS and has invented and prototyped a magnificent twisty puzzle. Puzzlation comes from Kevin Brain (Good last name.) As you can see from the images, it's an edge-matching puzzle app game. Here's what's particularly good: you can adjust the settings from easy to hard. Kevin makes a distinction between Corner Match & Edge Match, but they're really the same thing. When he means Corner Match, he's referring to each side having 2 colors. Tiles can be swapped. 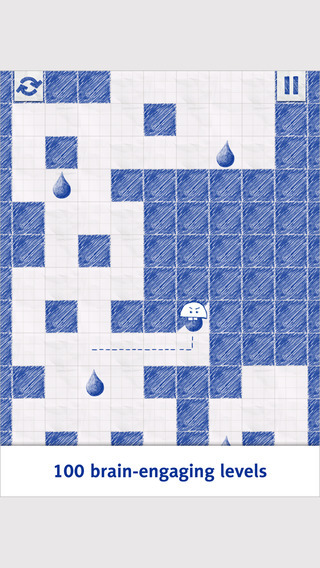 On the harder levels, tiles can only be slid. A lot harder. LaserBox comes from Eugene Dimitriev. 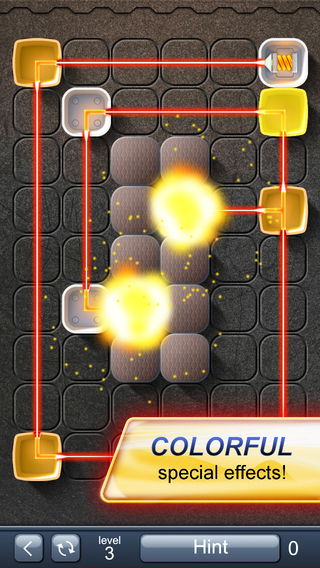 Yes, it's another Laser puzzle app game. I've played a couple dozen of these types. However, LaserBox is really well done. The graphics are very good. 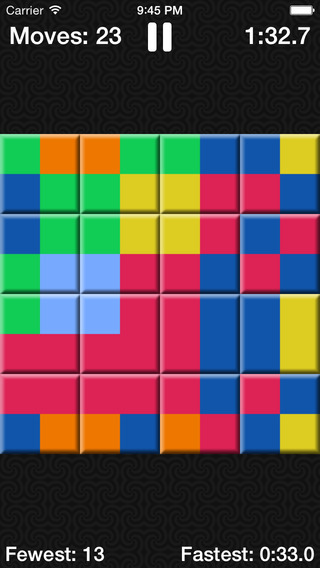 There is a good number of easy and medium levels that I solved pretty quickly. There are no ads! However, you can buy hints. What's different: some crystals have to be activated by more than 1 laser beam. Some squares must not be hit with a laser. Many levels have boundaries so that pieces cannot travel just anywhere. There are 100 levels and I have done them all. Although I admit I used hints for 2 of the problems. When using a hint, the game will show you 2 or 3 regions and you get to choose which region the pieces go. LaserBox offers a few hints for free. Yesterday I was giving a math test to my 7th graders and discovered The I of It. I solved the whole thing in about 1 hour. Loved it! It's cute, delightful and sometimes quite challenging. One element that I particularly liked is the fact that you must use the arrow buttons on your keyboard. So much fun! I don't know if the program will save your game mid stream. I was afraid it wouldn't, so I kept playing. Did you like Snake Slider? How about Wriggle? Or TRUpuzzlE? These are all classified as shunting puzzles. Choo Choo Puzzles are essentially the same thing. Except it's played on a hexagonal grid. What's different? The Choo Choo Trains cannot make sharp turns. There are 24 levels - I solved them all in about 1 hour. I think I'd like to see this turned into an app; it's a bit awkward manipulating the trains with a mouse. I saw the image of the fairy and wondered: is this a puzzle app game? Yes puzzlers, Pordlla is a genuine puzzle. Look at the second image. The object is to slide the rows back and forth until you think that things are lined up properly. When you've set it up, you click on the red button at the bottom and all the tiles will fall straight down. If there is a group of 3 or more tiles - of the same color - touching, they will disappear. The object is to clear the entire board - all at once. There are 100 levels. I've done about 60 of them. (Stuck on 41). The first 25 are fast and easy. Then they get harder. The last 20 - hard! I have no idea why Yuichiro Hoshi has chosen to use a fairy or angel. What's with the title? What I particularly like about this game is that Yuichiro has taken an old concept and added a nice variation. Remember Game About Squares? Arrowed: The Arrow Puzzle is very similar. The object is to tap on the arrows and move them in their stated direction to the black holes. An arrow can push 1 other arrow, but not two arrows. There are 60 levels. That's a perfect number to solve! I've solved 27 of them. I really like this game. 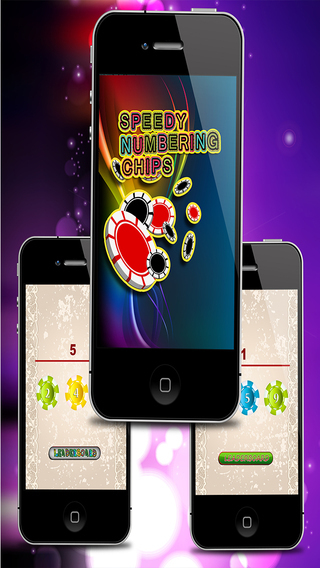 Speedy Numbering Chips is a point scoring puzzle app game. You are given 3 poker chips and must tap on them in ascending order within 2 seconds. According to the Leaderboard, there are only 6 people playing this game. 6 people! It's free! 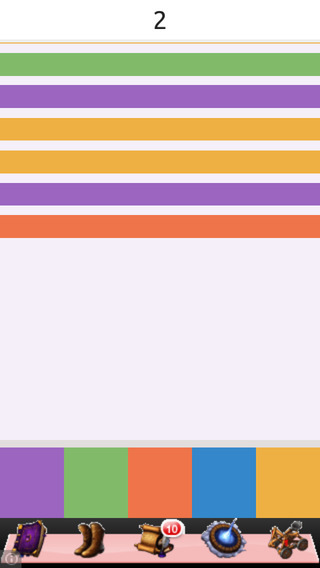 This clearly shows that there are too many games available. At first I thought Speedy Numbering Chips was awful. Then I played it a second and third time. I do believe that this game has some good brain-speed-action-value for people who are going through Alzheimer's. We should all be playing these types of games. Ruan Shilong has created an interesting set of maze-type-roll the ball puzzles. The object is to roll the balls until an obstacle has been reached and then get to an exit. We've seen this type of puzzle app game many times before. 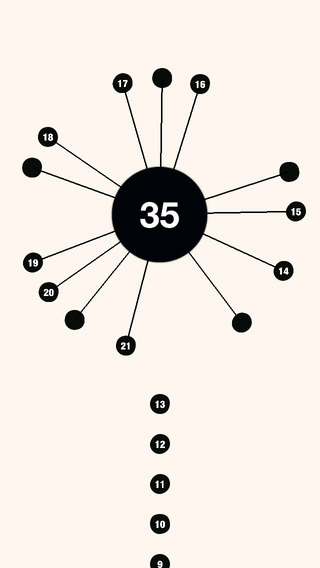 Here's what's interesting: most of the levels have multiple balls to exit. 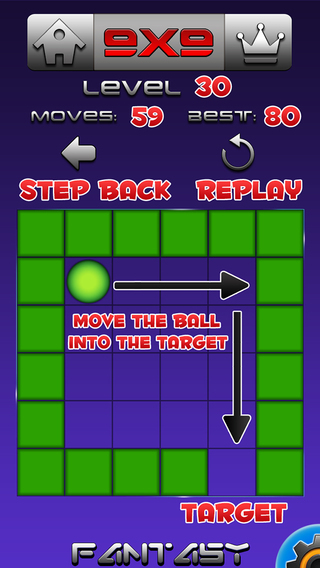 As soon as 1 ball goes through an exit, that exit becomes walled-off. So the real puzzle lies in figuring out which ball should use which exit. Also, you will want to minimize the number of moves. There are 30 levels in each grid size. I did 10 in the 6x6 grid and 2 in the 9x9 grid. I like this set of puzzles. If you've never played this type of game before, give this a shot. 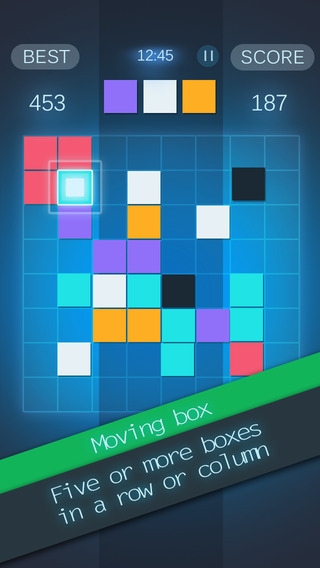 D-Box is a puzzle app game, whose objective is to score points. Your task is to move the squares 1 at a time to form a line of 5. When that happens, you score points and they disappear. After every turn, 3 new squares enter the board randomly. I played this a few times. My high score is 119 - not so great. 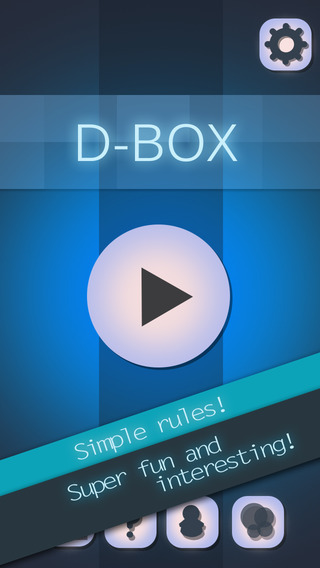 D-Box is similar to a lot of other games. Bee Cells comes to mind.